Welcome to the latest episode of BioTrust Radio, our weekly podcast dedicated to answering your questions related to health, fitness, nutrition, and supplements so you can get better results, faster! In today’s show, Shawn and Tim help steer you right by shining the light on supplements and supplement companies. To start streaming, or listening, right here on the blog, simply click the play button below. If you’d prefer to download the episode to your phone, tablet, or computer so you can listen any time, simply click on the iTunes or Stitcher link below. Enjoy! After you listen to the show, be sure to leave a comment or question below If we choose your question for a future episode, we’ll send you a FREE BioTrust product of your choice. Are you the type of person that things all supplements and supplement brands are the same? On the other side of the coin, maybe you’re a skeptic who thinks that all supplements are garbage—or worse, dangerous. Or, maybe you’re just overwhelmed when it comes to supplements. Either way, it’s likely that you’ve been misled. When it comes to supplements, we know it can be a downright confusing and incredibly frustrating world, filled with hype, fads, scams, and flat-out lies. 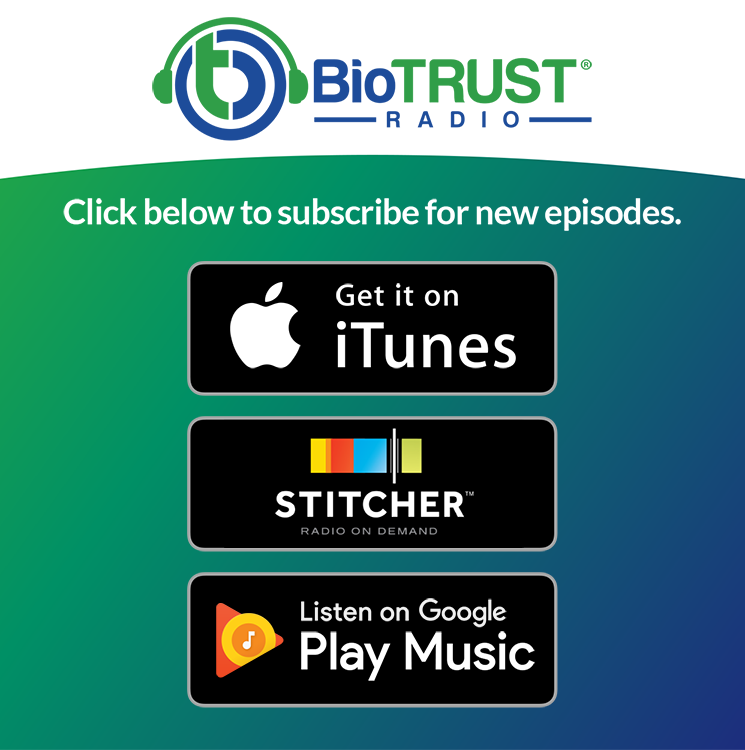 As your go-to, trusted health and fitness podcast, BioTrust Radio will help you navigate the seas of the supplement industry. We’ll cover these important topics and more. Enjoy! Shawn: Hey guys, this is going to be an incredible episode. We really dive in to some really interesting stuff here. Tim brings a lot of great facts up about the scams that are happening here. You won’t believe some of the things that we’ll dive into. I think they’re going to shock you. Maybe they won’t. I don’t know, maybe you think all supplements are garbage, but we’re going to tell you how companies do it right, in Episode 1, but we’re also going to get into what companies are doing wrong in the industry in Episode 2. So this is going to be something special. Tim: It sounds great. And this is coming straight from the mouth of the world’s greatest formulator, so take a listen. This going to be really important information and we’re looking forward to you joining us. Let’s dig in. Shawn: We have some exciting stuff planned. Just in this episode, we’re going to get into the quality that it takes to be a great company, what you have to put into supplements. It’s so much more complicated than people think. But we’ll make it easy. We’ll break it down for you. Then we’re going to get into all the scams and things that come up in supplements; all the loopholes that people exploit, that you probably don’t know. What we’re expected to do for you is break things down, make them fun and interesting, and we’re going to address myths and things that are hot in the news that people are talking about and that are confusing, like Whole 30, Keto, What The Health, and all these kinds of things that you’re hearing about. We’re going to break them down because we have a background in this and we want to help people. We want to educate people. I think that’s our main goal in life is to provide that kind of information and empower you, the listeners. This is a community. We’re all a team and we want to hear from you too. What it is you want to hear? What is it you want us to do? I think that’s really important that we’re serving you. We do that with our products. We survey the customers to say what’s our next product, and the same is going to be the case with this podcast. It’s your podcast. We want you to contribute. We want you to be a part. And maybe at some point you’ll be on the show. We’re going to work to have this thing expanding and being more robust as we go. Tim: Absolutely, Shawn. I think that’s a great foreshadowing of what people can expect. Just remember that we’re the trusted resource. That’s what we’re trying to convey to people. Like you said, today we’re going to be talking specifically about supplements because it is very confusing. This is our full-time job, to build these supplements and to help convey the truth to people. We understand that it can be very, very confusing. We were talking about this recently, that we have several different viewpoints when it comes to supplements. You obviously have people like you and I, who are avid and passionate about supplements. We kind of know what to look for, but we love taking supplements to complement our healthy lifestyle because we know the power that they have. But you have a lot of skepticism out there, just in the general public. We talked about maybe there’s kind of like two major viewpoints within that skeptic camp. On one hand, you have people that think that they’re all the same, that everything on the shelf, whether you’re at Walmart or GNC, or you’re looking online, and everything’s the same. There’s no difference. On the other hand, you have people that think that all supplements are dangerous. You need to avoid them because we read this story here. So, you have a lot of skepticism. That’s kind of the take-home point there when it comes to supplements. And I think one area of confusion is the regulation of supplements, so I was wondering if you might be able to talk a little bit about how supplements are regulated, if they’re regulated. What are the kind of the guidelines there? Shawn: Yeah, I’d say there is regulation and there is protection of supplements. One thing that happened in 1994 that was important was the DSHEA, which is Dietary Supplement Health and Education Act. That actually protected supplements in a way that we were able to take all these things and not have them sucked up by the drug companies or be illegal. So it protected them on one hand and then it offered some, I’d say, loose regulations on the other. The FDA and the FTC have some oversight in the dietary supplement realm, and the FDA it’s related to the products themselves, the ingredients, if they’re dangerous, and those kinds of things. Auditing a facility, like the contract manufacturer where the supplements are made. There’s been cases like with USP Labs in the past, that ingredient DMAA was very controversial. Some people associated that with deaths. So there was a strong action against DMAA to have that ingredient pulled in all the products that had contained it pulled off the market. And then the FTC, it’s more marketing-related and there’s a lot more action that happens with the FTC. There’s a lot more litigation around things like that because they’re looking at copy, the marketing be it like on the radio. Wherever it lives, like it could be on social network like Facebook, and things like that. Then FTC is looking at that and are you making claims that are structure-function claims that aren’t justified. Is it essentially like a drug disease claim? Like you can’t make claims about something dealing with pain or inflammation and some of these things that we’ve talked about. So there’s a lot going on, but I would say that the regulations are loose because there’s just not enough people. So it’s those hot-button things that maybe get caught. Pills that are at the convenience store for libido that maybe contain real drugs in them, at different points. They’ve been tested for that and a lot of those products have been pulled from those convenience stores. Obviously, there’s been some sport nutrition products that have been found to be unsafe or of concern. I don’t believe that ruins the entire category of sport nutrition. I love that category. I think there’s many great ingredients in that category. And the same with weight management. There’s a number of products there that they get maligned because there’s been some maybe misuse of some of those products. There’s been some spiking of some of those products. But I would say there’s a lot of really great products for weight management too, some of which BioTrust makes. I would say that that’s my answer, is that there is some self-policing and obviously that some companies like BioTrust will choose to do it right, and then there’s a lot of other companies that probably won’t. That happens. So that’s what I’d say. Tim: That’s a great answer, Shawn, and really foreshadows the fact that navigating the seas of the supplement industry, as a consumer, is challenging because it still leaves a lot of questions. A lot of questions. So, I think one thing that we really want to get into is how to make the right decision, and we really want to fortify people’s trust in BioTrust, but also help them understand what to look out for. One thing that people may not understand is all that goes into, from start to finish, getting to the end supplement that they find on a shelf. Maybe let’s take a walk down production lane, and to get a better understanding of what do you think, maybe talk about what BioTrust does first and then we can get into how people can cut corners and things like that? So let’s talk about maybe the right way to do it and then we can you can dig in from there. Shawn: Thank you. So I really appreciate that title that I’ve been given. I take a lot of pride in it and I really appreciate that our Co-founders Josh Bezoni and Joel Marion went out to just find people like me and like you. I think they chose not only people that are educated and talented, but they also chose people that are passionate about what they do and want to educate and empower, and that’s what I care about. I want to make the best product possible because I use it, my family uses it, my friends use it, and that makes us come from a very different place when we are putting our product together. We’re going to put the right ingredients in to make it work the best, instead of ingredients that just look good on a label. And we can talk about some of those loopholes later that happen, but that’s where it starts is the passion and the right people. So, from there, we do a competitive analysis. We look at like all the products on the market and we say what is it going to take for us to be the best? What is it that they have that they do well, what is it that they have that they’re not doing well, and how can we differentiate ourselves and make something truly special? And if we can’t make something truly special, if we can’t distinguish ourselves, we’re not going to do the product. So, it starts there. And then we look at the cost of the ingredients. We look at the studies around each ingredient. We’ll do a deep dive on the research and say here’s all these ingredients that we’ve heard about for whatever the product is. Let’s say it’s for cognitive enhancement and similar to our product, Brain Bright. We looked at 50 ingredients, and what’s all the research on these ingredients. And then the research, it needs to be very conclusive, where we have healthy human data, like multiple studies. Not just disease studies, not just animal studies or in vitro studies, but healthy human studies in peer-reviewed journals that are of quality, and we take it from there. So, oftentimes, we’re only left with a handful of ingredients. Yeah, there’s like 50 ingredients that I’ve heard a lot about and they may work. Some of them may work, but is it the right form? Is it the right dose? Is it what’s in these studies? Who knows? So what we like to do is take the stuff that we know works and build a product off of that, because ultimately that’s what we want, is a truly effective product. And that’s what we’re trying to give our listeners and our fans at BioTrust, is the best possible products. Then we also make sure that those ingredients are natural, and that’s a big focus for us is these ingredients that come from a natural place, that are safe. You think about our BioTrust Low Carb protein. It has rBGH/rBST free, whey and other milk proteins. It is non‑GMO, antibiotic-free. The cows that it comes from are not treated cruelly. We make sure of that. There’s no artificial flavors, colors, or sweeteners. It’s just so clean, top to bottom. We don’t put in any soy ingredients, that there’s often concerns about that. So really, our goal here is to make a clean and effective product. Then we do ingredient testing. We don’t just go to our contract manufacturer and say, “Here’s this product that we want. Can you make this for us?” and then they do all the work. No, we’re doing the work here, like we’re working with all of our vendors from all over the world and we’re telling them, “Look, this is the form that was in the study. This is the exact form we need.” For example, let’s say you have ginseng standardized for—and this isn’t in any of our products—but like ginseng standardized for ginsenoside A at 10% or something. That’s what was in the study and that’s what we want. And they say, “Yeah, I have ginseng.” Well, is it the ginseng root? Is it standardized for ginsenoside and HPLC, which is the best standard that you can test these by? And they’re like, “No, no. It’s ginseng leaf,” or a whole plant, and it’s not standardized for anything. Well that’s a completely different thing and is not going to elicit what happened in the studies, right? So, that’s a big difference for us. Maybe the consumer just knows I like ginseng. I tried it once and it was effective for me. But that’s why I think there’s a lot of equivocal data out there on supplements as far as anecdotal or personal use. Some people are like, “Yeah, it works great for me,” and some people say, “I didn’t get anything from it.” Some people say, “I love ginseng,” and other people say it doesn’t work. So, I mean, this happens so much but I think a lot of that comes from the fact that there’s so much difference in these ingredients that people don’t know to look for it and know to drill down in, and that’s where we’re going to make a difference. Tim: Yeah that’s a great point, Shawn. I think we’ll dig into that more in the second half, when we get into some of the scams or things to look out for. One of the things that really stood out for me there is like this could be really confusing to the listener. I mean, you’re breaking it down on a level that they understand, but when we start to trace the path back from start to finish, and that’s kind of what I wanted to highlight because I want people to know that we’re doing all this research for them. That they can trust what we’re doing because we’re doing all the legwork for them. So I wanted to point that out that if I was just a consumer this would be so confusing. How do I know? I wanted ginseng but what am I even supposed to look for? And we can cover that more as we go through, but I just wanted to highlight that this can explain why there’s skepticism and confusion, because there’s so many moving parts. And like I talked about, we’re going to get into more how companies can be cutting corners and things like that. One term that you had mentioned a couple times so far is co-man or co-manufacturer, and I just wanted to kind of define that for some people. So, you have some supplement companies that actually have manufacturing facilities themselves, like some of the bigger companies that are well established. NOW Foods is an example that comes to my mind, and there’s several others. But many supplement companies don’t have their own manufacturing plants, so they go out and work with a co-manufacturer. Shawn: A contract manufacturing, yeah. Tim: Just in case that term wasn’t familiar to people. We’ll talk a little bit more about that, too, because there’s different tiers of quality when you go to these co-mans. Some are very well trusted and respected and some are maybe a little bit more garage backdoor kind of thing. Some of the things that we’ve talked about so far, the competitive analysis that goes into it, and really finding how we, BioTrust, can find our niche and really understanding, if there’s room, how can we take what’s the best thing out there and make it even better. Our goal is to make the best. Then we talked about all of the research that goes into it after that consumer research in terms of finding the best ingredients in the best forms, in the appropriate amounts, and then going into all the ingredient testing. So now we’ve got all the ingredients, now we’re going to make the product. Shawn: Well, I will say one extra thing on those ingredients. You mentioned this kind of going all the way back like you said, we go all the way back. We actually have Chain of Custody documents that take us all the way back to that field, wherever it was harvested. We know where it was extracted, and then it may go to an ingredient supplier at that point. So we can go further back than the ingredient supplier. We actually demand all these documents, and I would say probably 99% of companies don’t do that. So we have traceability of all of our ingredients. We have an understanding of when and where they were harvested and the means of extraction. There can be alcohol or ethanol extraction, there can be cold water extraction. There’s all these different methods to pull out these compounds and standardize them to X level in these herbs. And we have that information. And we actually specify on these documents, these spec documents, the specifications we need for that ingredient, and then the contract manufacturer doesn’t have the latitude or leeway to change that ingredient down the road. That’s what we want. We want it from this supplier, that comes from this field, we’re using this extraction process, standardized for this level, tested out in the best methods, like HPLC. Then we actually know the species. We actually test that out with HTPLC. There’s a lot of these ingredients, like ginseng, like ginkgo that are out there that get spiked with other ingredients. There’s much cheaper versions of these ingredients that they can spike them with. Like green tea standardized for polyphenols. Some people use grape seed and other things to the throw in. I’m sorry, cinnamon. That’s the one that they throw in, like the grape seed or green tea, actual into to crank up the polyphenol levels. That’s difficult, to get these ingredients that are actually pure. And I would say, there again, that so many, 90% of the ingredients out there or gingko, ginseng, cinnamon, and all these ingredients that are popular. The more popular they are, the more they get adulterated. And adulterated just means spiked with other things to bring up these levels. But we test for all that. We test for the species. We know the standardization. We make sure that it’s the root and not the whole plant, if that’s what was in the study. I’d say that’s where we really cut our teeth. Tim: Yeah, that’s a great backdrop, Shawn. And that’s good foreshadowing for the second part of what we’re going to talk about today. We talked about all the ingredient testing that needs to go into it before a supplement is made, to confirm that everything that’s going to go into the formula is accurate, or should we say what’s on the label is in the bottle so to speak. We really confirm that, or any companies should, and that’s what we do with third-party testing. So I don’t want to just make it about BioTrust because we want to take a stroll down what should be happening. And there’s other companies that do this, but it’s the minority that are doing things the right way. So after the co-man or the manufacturer blends everything together so that it can end up in a pill or in a powder form, that formula or that finished product should be then sent off to a third party to test. To make sure that label is accurate. Shawn: Exactly. So we’re qualifying the ingredients, like I was talking about, or when we’re looking at the finished product, we send it out to the top tier third party labs. So that means these Covances and ChromaDexes and Eurofins, these are the labs that the government would use on an investigation of some homicide or something. We’re using the elite labs. We can get into what other people use in the next segment, but we’re using very trusted, very expensive labs. And in some cases, we’re actually developing standards to test the ingredient. Sometimes there are ingredients that have been around a while, but we want to have an understanding of that ingredient and know how to test it to make sure it’s the right strength, the right purity each time it’s going into our product. There again, we’ll spend $50,000 to create a standardization for these ingredients. No one else is doing that. So that’s very unique that we’re doing that. Then what’s really cool is we take it one step further even. This is where it really gets exciting, and I know you as the Director of Scientific Affairs have influenced the design of some of these things that we do these finished product studies with universities and what’s called CROs, these private research companies, and we have the research on our products to show that they actually work. I mean, yes, we took ingredients that have studies, we put in the right forms, the right doses. We put them all together. We include each to complement each other, like using the science, understanding the biochemistry and the mechanisms of action, and say all these ingredients are complementary. They work on different pathways. So this makes sense. The story is all there, the data is all there, but does the finished product actually work? That’s a question I think we started in a great place. But the cool thing is it seems like every product that we do test ends up working very well. But we see in our studies, we’ll get data to show that it’s safe. We’ll look at blood pressure, blood glucose, heart rate, and all those kinds of things. We’ll have a study to show it works acutely. In that moment does it, let’s say, raise metabolism. And then we’ll look at things like our weight management products. Like we’ll say, okay how did it work over eight weeks? What happened body composition-wise. So we’re looking at all this stuff and it’s, again, very expensive to do all that. But we want to go that extra step. We want to give our customers that assurance that all the data is there that we took the time. And when we’re going to use the right ingredients, we’re not going to run and hide. We want to set ourselves apart from everyone else. We want people to dig in. We want people to say, “Hey, these guys are different. They’re doing stuff that no one else is doing. They’re using the right ingredients. They’re doing everything the right way, so this is why their products work. This is why I trust BioTrust.” And I think that’s really important that we set ourselves apart in that way, in a way that I think most companies are just not doing these things. Tim: Yeah, I totally agree with that, Shawn, and really highlighting some of the unique aspects that we go into. To take it a step back, one thing that we talked about labels and how the ingredients that are in the product should match the label. That’s very important. To me, that’s communication to the customer what they can expect, again, because you should have some knowledge of what you’re looking for. But also what I want to highlight there is that when we do that third-party testing, we’re also looking for potentially dangerous things that companies aren’t testing for; whether that’s contaminants, toxins, fungi, molds, bacteria, and things like. Tim: There’s definitely federal standards for all those types of things. We want to drastically exceed those things. A good example, to me, is our protein powder, , and even our upcoming plant protein. Those are tested for heavy metals, which people don’t often think about, but we want to make sure that those are minimal. That there is nothing there because I know there’s been a lot of independent research on various proteins, and shockingly high levels of these heavy metals. And we think, “Oh man, here I’m doing myself this huge health boost by taking these supposedly healthy supplements, but I’m actually putting dangerous levels of contaminants in my body.” So I wanted people to understand that there’s testing that should be done on those things, to make sure that you’re basically putting clean food into your body, or clean supplements into your body from that standpoint. We talked about the plant protein. We’re also testing for things like pesticides, herbicides, and that our products are free from those. That’s a huge concern for people. That’s why you highlighted non-GMO, and our entire product line is non-GMO. It’s natural. So I think we covered some really good really good background information here, and I think it’s a perfect segue into starting to talk a little bit about supplement scams or the loopholes and the concerns that people should be aware of when they’re going to choose supplements. Do you agree? Shawn: Oh man, this is where I’m going to get heated. Stay tuned for Part 2 on BioTrust Radio, where we go through the exciting stuff here. We’re going to get into the scams that happen with quality and supplements. We talked about what a good company does. In Part 2, we’ll get into what bad companies, or maybe at least negligent companies, do.